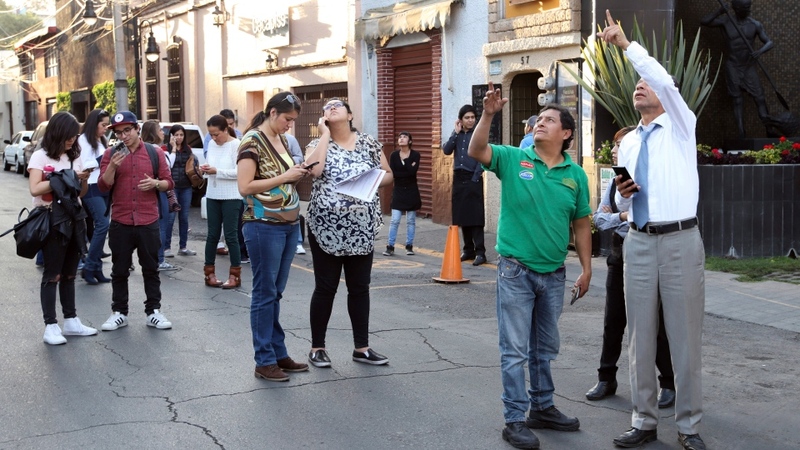 MEXICO CITY -- Mexico escaped major destruction from a magnitude 7.2 earthquake that jolted southern and central parts of the country, authorities said Saturday, with mostly minor damage and no deaths directly caused by the temblor five months after two other quakes killed hundreds. A national emergency committee that convened after Friday's quake adjourned in the afternoon after reporting 200 homes had been damaged, primarily in the southern state of Oaxaca, along with the city hall and main church in the town of Santiago Jamiltepec. Two people sustained broken bones but had been treated in Pinotepa Nacional, Oaxaca, and their lives were not in danger, the Interior Department said in a statement. However 13 people were killed and 16 injured when a military helicopter carrying officials assessing damage from the quake crashed late Friday. The Oaxaca state prosecutor's office said in a statement that five women, four men and three children died at the crash site and another person died later at the hospital. All the victims were on the ground at the time of the crash. President Enrique Pena Nieto said via Twitter that Interior Secretary Alfonso Navarrete and Oaxaca state Gov. Alejandro Murat, who were on the helicopter, were fine. When the quake struck Friday, Maricarmen Trujillo was on the same eighth floor of a Mexico City office building where she rode out a Sept. 19 earthquake that killed 228 people in the capital alone. "I relived a lot of those moments," Trujillo said, still jittery. This time an emergency app on her cellphone gave her a 30-second warning before things started to shake. She stayed in place, but felt more prepared. Scars from a magnitude 8.2 quake Sept. 7 that killed nearly 100 people in Oaxaca and neighbouring Chiapas are still fresh, while in Mexico City, wounds from the Sept. 19 quake remain visible. Many buildings left uninhabitable are still awaiting demolition, and people flooded into the streets as the ground seethed Friday. The U.S. Geological Survey originally put the magnitude of Friday's quake at 7.5 but later lowered it to 7.2. It said the epicenter was 33 miles (53 kilometres) northeast of Pinotepa in southern Oaxaca state. It had a depth of 15 miles (24 kilometres). USGS seismologist Paul Earle said it appeared not to be an aftershock of the 8.2 temblor on Sept. 7 in Oaxaca. Gladys Barreno Castro, who was at work on the 29th floor of a downtown office building in Mexico City, recognized quickly that the shaking was not as violent this time. "It lasted a long time, but it wasn't as strong," Barreno said. "I didn't think that it was going to destroy the city like the last time." Associated Press writers Mark Stevenson and Christopher Sherman in Mexico City contributed to this report.